Ok, I'm not big on fashion and I'll leave fashion reviews to the experts but when I find decent clothing for guys I'm going to just have to put a brief post about it here. I had run across a shop a while back and purchased a couple of t-shirts that I liked, but hadn't visited the main store until just the other day. Now I wish I'd done so sooner. Here's a quick snap of some of the shirts they've got here. In the lower right side of the picture is the gem of the shop, two packs of 5 plain t-shirts in assorted colors for 200L each. It was an easy decision for me to pop the 400L total for both packs. They are no-copy, no-mod, so you can't change or make copies of them but you can give them away if you happen to not like a particular color or want to give them to someone who needs a style makeover. The shirts that have stuff on them are also nicely done and reasonably priced at 50L each, so take the time to check them out as well. Oddly enough, the ones with patterns are no-transfer so you can make copies and modify them, but not give them away. So gift givers, beware. These are probably some of the best looking t-shirts I've seen on the grid so far. The only thing I have against these shirts is that they are made on the jacket layer, meaning you can't wear anything over them, which is disappointing because they'd look good under some other things I have. Oh, I understand they had to be made on the jacket layer to get the pull over look, but it'd be really cool if I could get a version of these on the undershirt and shirt layer so I could wear them under a couple jackets I have. For those that are interested in that sort of thing, yes, the monsters are for sale, the one outside for 350L and the ones inside for 340L. You have to find the right spot (the claws) to click on them before the Buy option comes up, but they can be purchased. If anyone is interested in a few more pictures of me and the monsters, there are a couple up on my SLBuzz account, for some reason they didn't crosspost to Fickr like they are set up to do. So, if you're a guy looking for something good looking to wear, check this place out. The prices are reasonable and the shirts look good. 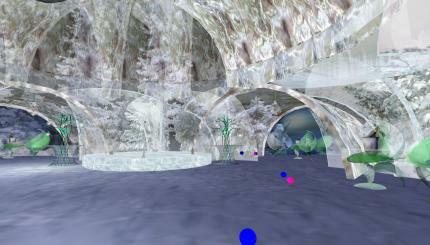 Now this is what it's all about.......using Second Life for new and interesting things. 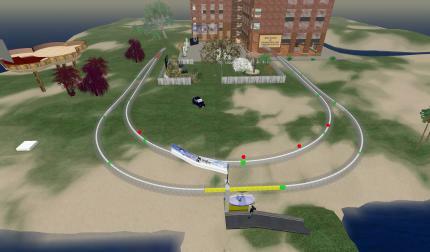 In brief, the article is about a University of California - Irvine computer scientist named Crista Lopes who has used Second Life to test out software to control a virtual rapid-transit system called SkyTran. What's really cool is that after the software's been tested out in Second Life the plan is that she's going to transfer it to a real life version of SkyTran. Apparently the physics of Second Life (Havok 2, for you technical types) is close enough to the real world that she can cheaply simulate the SkyTran operation and work out the kinks in the system, in both the physical design as well as the controlling software. For example, according to the article, they discovered that aligning the express track directly over the platform, while perfectly safe, wouldn't feel that way to the rider. Not something you would notice based on a CAD drawing but apparent to an avatar riding the pod in Second Life. They also discovered that if a clear glass pod as is used in the Second Life version, were used in real-life, it could expose passengers to a fast, repetitive pattern of track components which could potentially produce seizures in some people. If you do decide to visit don't expect much, it's not fancy and it was obvious to me that it is truly an experimental design as stated in the article. When I was there I wasn't able to persuade the pod to take me around, though I was able to reset the tracks and watch them rebuild themselves by messing with the two white blocks on the ground, clicking the buttons to reset everything and the blocks themselves to rebuild it all and that was kinda neat. I'd really love to see more of this sort of thing in Second Life, it seems to me that there is so much untapped potential in this virtual world of ours, we've just scratched the surface and there's more and better to come. In real life I'm a computer programmer, so one of the first things I did when I came into Second Life was seek out Dr Dobbs Journal's island and sign up for their Life 2.0 conference. Dr Dobbs is a programming magazine that's done some articles on Second Life and has really embraced the potential of Second Life and, I think, done an extremely good job at using that potential. They've done a couple of in-world conferences and on a weekly basis they do presentations and stuff related to computing and virtual worlds. I'll probably do a more detailed blog post on them later, but for now I want to show y'all the Winter Wonderland build that Sun Microsystems did. So as part of this group, I was invited to a holiday party hosted by Dr Dobbs and Sun Microsystems. Unfortunately, I was unable to attend due to real life work, but decided to pop in after the fact and see the place. Above is the invite to the party, I thought it was very well done though I wish they'd warned me how big it was, kinda startled me when it rezzed. 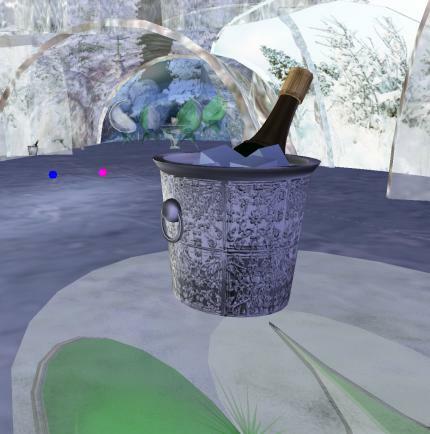 The invite came complete with snow and music. Clicking on the invitation as instructed, I got a note card with information on the event and a bookmark, the slurl to which you will find below. 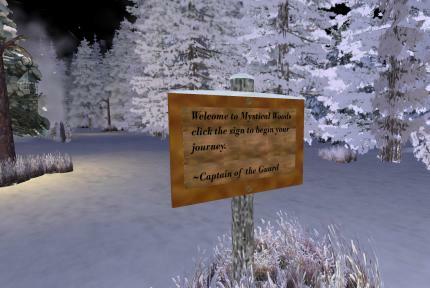 Here is the sign which greets you at the landing point, clicking the sign gets you a note card with some instructions and a few goodies to keep you warm. 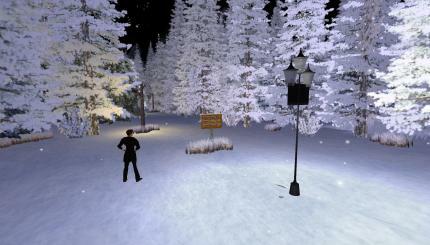 Please read the SL Client Optimization instructions to have the most enjoyable experience. When you are ready to begin your journey, follow the lanterns along the wooded path, be careful not to stray off the path as there are wolves and bears about and it is easy to become lost. Everyone at Sun Microsystems hopes you have a pleasent visit to the Mystical Woods and that your holiday is filled with much happiness and joy! Here I am in front of one of the many lanterns which guide you along the way. They give me of that old fashioned, nostalgic, mental picture of winters past. 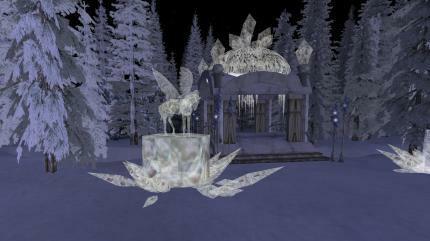 A view of the pathway, the lanterns light as you approach, guiding you along. I seem to have found some of the wildlife that lives in the woods. I guess they weren't scared of me. This was a very nice little frozen pond for skating on, very much in keeping with the old fashioned feel of the build. 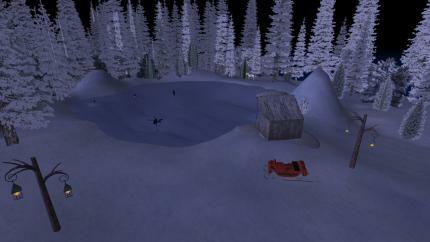 An aerial view of the frozen pond, there is a little shack there to keep warm in if you're not skating. This must be one of the cottages mentioned in the note card, perhaps the woodsmans cottage? The Governors Home, a very beautiful place, just need to find a way to get it out into the real world so I can live in it. I don't think the governor will mind if I take a quick look inside.........hmmm, a very cozy living room, fire in the fireplace, Christmas tree all decorated, perfect place to relax after a hard day of governing. After trekking through the woods, I finally made it to the Ice Palace. This was where the party was held. The big tree you see just behind the fountain is the Wish Tree where you can place your Christmas wish in the form of a note card. Back the way I came, the Marbled Bridge and a couple of really pretty ice sculptures. 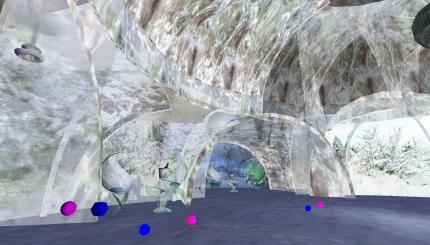 Inside the Ice Palace, there is a fairly large area for dancing and individual dance balls all over. To the left side of the picture above, you can see one of several nooks where folks can go and sit. Hmmmm, where's the door? How did I get in here? A word of caution, the door is kinda hidden on the inside with a picture of an outside view to camouflage it, in the picture above you can see what looks like a bunch of snow covered trees through an opening, that's the inside of the door you entered to come inside. Just click on it and the door will open and you can go out again. Another angle, the Ice Palace is basically a big dome shaped structure with smaller areas connected to form the nooks. 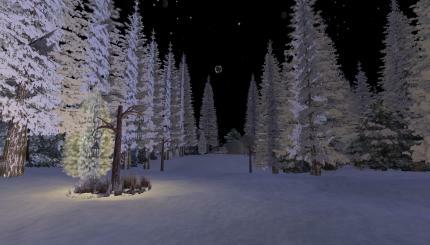 I thought this was a very nice winter build from a visual aesthetic point of view, a nice little place to wander around in with that someone special. Definitely worth the time to go check out. I was looking through some back issues of Computerworld magazine yesterday and noticed one had an article on Second Life boldly presented on the front cover (Dec 3, 2007 issue). 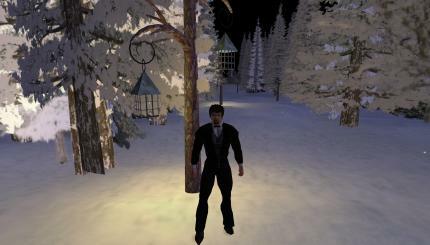 The article starts with the author stating that he didn't want to do it and considers himself "too old and too serious" to look into Second Life. I guess I have to give him an A for honesty for admitting it, but I feel like the attitude going in doomed the article to be a negative one from the beginning. And indeed, I found that it had a negative tone throughout which is unfortunate because it'll stop people from even looking to see what Second Life is all about. It is one thing to point out the flaws in the experience, but in my opinion this article went beyond that. He had a negative experience, as I suppose many do, but is there really an excuse for that? An excuse for going in blind and uninformed? 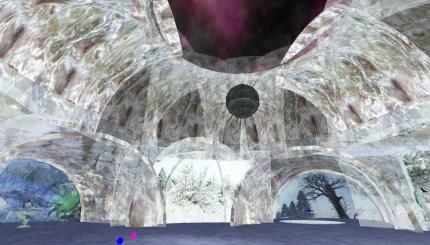 In my opinion, no, there is no excuse for anyone to go into Second Life and not have background information on what it is all about and a vast list of things that interest them to check out. Do a Google search on the 3 words, Second Life Blog, and you'll get pages and pages of results that even a cursory examination of some of them will give you loads of information on what you can do in Second Life, more than enough information to figure out how to have a good experience. Just reading Natalia Zelmanov's blog, which came up for me on the first page of that search, would be enough to give a person a vast head start just from the tutorials alone, especially her Getting Started in Second Life Guide. For myself, from the first day I logged into Second Life, I made it a habit to do a Google search every day or so using simply the words Second Life and see what new stuff came up, from articles to blog entries. In the 7 months or so that I've been in Second Life, I've never once wanted for an interesting place to go and see, never wanted for a nice place to go and "dance" and chat with nice folks. In fact, there are places I want to visit and haven't had the time to, things to do that I would like to and haven't. 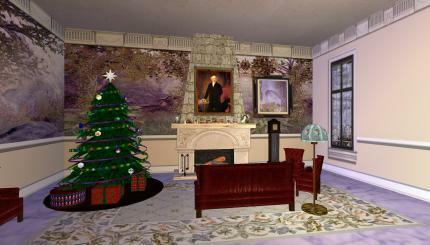 Ok, so there are going to be some people who just don't get it, who don't see the point in Second Life and that's ok. I don't see the point in some stuff that other people do and enjoy, but I at least hope that if I'm going to try something, I have informed myself about it enough to know that it's something I'm not interested in rather than pass by an opportunity to do something interesting because I wasn't informed. Second Life boring? In my opinion, definitely not, but it's not going to be handed to you on a silver platter (since when is anything like that? ), you have to go out and find the interesting stuff. 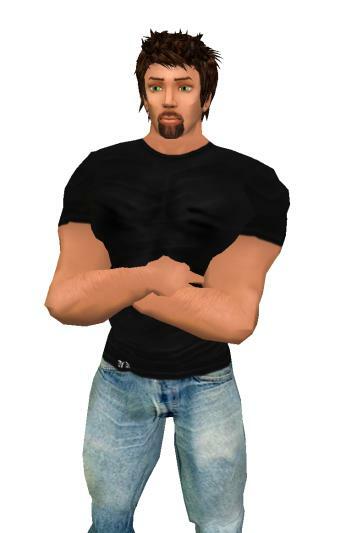 Might I suggest you begin with a simple Google search on one of your favorite things and add the words Second Life to that search, you might be surprised at what you find. 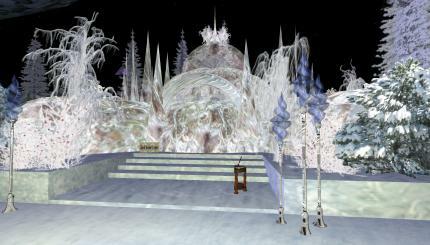 First on my list is what has to be the most useful blog for someone in Second Life to read, and that is Natalia Zelmanov's Mermaid Diaries Blog. This blog is simply incredible, it's got just about everything you could hope for in a blog about Second Life, posts on neat places to visit, tutorials on just about anything you can think of that you would want to see a tutorial for as it relates to Second Life, commentary and advice on an assortment of subjects. If there were only one blog on Second Life that you were able to read (other than the official blog) then this would be the one I would recommend reading, hands down. Next on my list is a podcast which is one of my "must listen to" podcasts and that is SL under the Radar podcast by Radar Masukami, he interviews some of the more interesting characters in Second Life and also highlights some of the places he's visited. It's one of the most entertaining podcasts I listen to, my favorite episodes have to be #10 and #11, which featured some of Radar's friends and got kinda wild and crazy, but they are probably the best ones he's done. I also like the episode about his visit to New Babbage (episode 16). I recommend that you go back and listen to all the episodes available, they are well worth listening to. My only complaint is that I want more, more, more, I've listened to every episode available and Radar's been slow in posting new shows lately, but I'm hoping to see more soon. They're certainly worth the wait. Radar also has a regular blog called Reading Radar which is a good read, where he does reviews of places visited and people encountered. Another on my list of "must listen to" podcasts is Going Broke with Daphne and Tamara, which is a podcast on Second Life fashion and good places to buy clothes and shoes and all the accoutrement's necessary for the stylish avatar. Now I'm not really interested in fashion on a conceptual level, whether it be in Second Life or Real Life but I do like to dress nicely in Second Life and am fairly picky about the stuff I wear on a day to day basis in world (yes, I actually change outfits in SL quite often and don't like to wear junk unless it's for a contest). I've been lucky enough to chance upon some really nice outfits in SL and have spent a few thousand lindens on clothing (gasp, yes, a guy spending lindens of clothing instead of weapons, who woulda thunk it?). I have picked up on a few places to look for decent guy's clothing by listening to this podcast, but mainly I just listen to it for the entertainment value, the interaction between Daphne and Tamara, plus their guests, is a real trip and the podcast is usually being listened to by me same day it comes out. I've gone back and listened to all of their podcasts and I have to say they are uniformly well made and great to listen to, though they have noticeably improved over time. Yet another "must listen to" podcast is the Pod Mafia Podcast, another entertaining podcast which is done in segments where a wide assortment of topics are covered, with musical breaks in between. Gomem Desoto, Stuart Warf and Yxes Delacroix are the hosts and the banter and interaction between the three makes this podcast most entertaining and informative. Having gone back and listened to all the podcasts, I have to say that the addition of Yxes as host was just what the podcast needed, the podcasts prior to Episode 6, frankly weren't that good (sorry guys) and things really picked up by Episode 8 when Yxes was featured, and Episode 9 when she joined the show as a co-host. Gomem and Stuart are naturals to podcasting, but the other previous participants weren't, which isn't meant to be a knock against them, not everyone is going to be able to sit and chatter on about a given subject and be entertaining to listen to. And after listening to the earlier podcasts I got the sense that there wasn't a good sense of direction for the show until the podcast was "restarted" after roughly 6 months, then a few months later when Yxes was added. I think Gomem and Stuart just needed a good "straight man" to work with and Yxes fits that need precisely. I love listening to them and highly recommend the podcast to everyone. 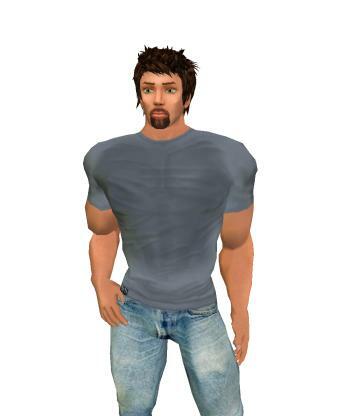 And I can't not mention the very first podcast about Second Life that I started listening to, which lead me to SL under the Radar and all the rest, and that is Will Ross the Travelling Avatar, quick and dirty tips for a better Second Life. It's a short podcast, about 5-10 minutes but the tips he comes up with are pretty useful and it's definitely worth the time to listen. Wish he'd do a longer podcast, even if only slightly longer, so he could go into more detail on some of the topics he covers. Last, but not least, on my A-list of blogs that I just have to mention is What is this Crap? a blog done by the infamous Crap Mariner (well, he's infamous to me now after hearing about him on some of the podcasts featured above). Crap is a very interesting character, and is very prolific with his blog(s) and other ventures. I don't even have words to do him justice, you just need to go read his blog. But wait, I simply can't do a blog post on Second Life blogs without mentioning one other blog and that is the blog of..........Mr Watermelon himself, Torley Linden. His blog is definitely the most......colorful, and he's a very interesting character. As you can obviously tell by the Linden name, Torley works for Linden Labs and is probably the most recognizable figure representing Linden Labs in Second Life. 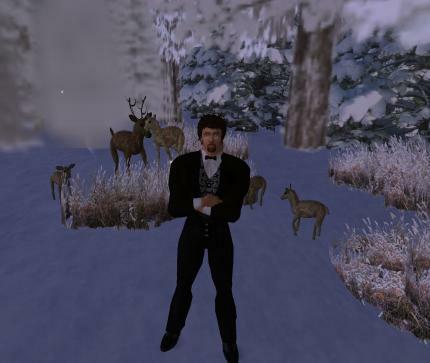 He blogs on a variety of subjects, including Second Life and has done and continues to do some absolutely must see video tutorials which are on YouTube, check them out at Torley's YouTube User Page. And you have to visit, in world, Torley's Watermelon Land which is very.............watermelony, just go see it and you'll understand. Ok, I guess I've written a monster blog post, and here I thought I'd have trouble coming up with something to say in this blog. There are so many good blogs and podcasts related to Second Life, I feel bad that I can't mention them all, but ya gotta stop somewhere. Perhaps I'll do another post sometime and highlight some of the other really good blogs out there.